In Greek mythology, Sisyphus was the god of commerce and travel. He was not a good god, however, which provided an explanation to the ancient Greeks—wrong as it was—for business deals gone bad and tragedies at sea. Zeus looked the other way as Sisyphus carried out his crimes against humanity, but one day he crossed the line. One day Sisyphus committed an act so heinous that Zeus had to punish him. So for the rest of eternity Sisyphus was condemned to push a big rock up a tall mountain. Just as he reached the top of the mountain, the rock would roll to the bottom, and Sisyphus would have to start all over again. Here the ancient Greeks get it right. There’s nothing more painful than meaningless work. When asked to push a big rock up a tall mountain day after day, people stop caring and simply give up. This happens because all of us at our very core want to contribute to a cause that’s bigger than ourselves. Unlike robots, we need a reason for the things we do. The bigger the reason, the more we’re willing do. And it’s here where business growth begins: providing your people with a purpose, motivating them with a mission that matters. Starting with why. 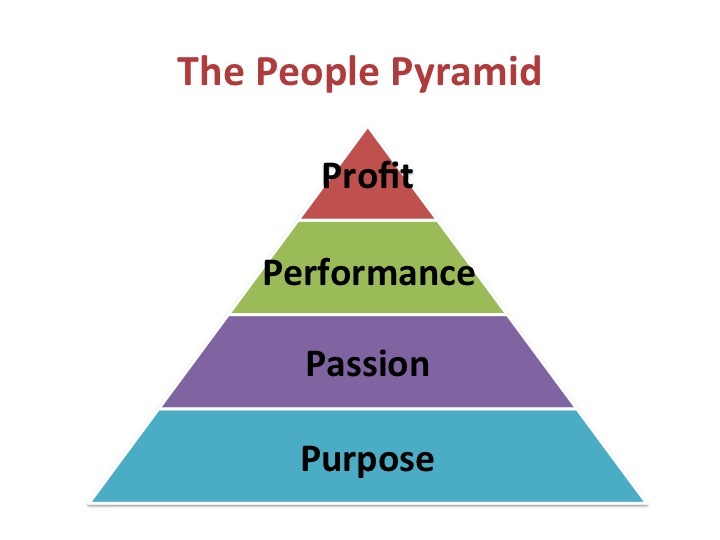 Starting with why begins at the base of the pyramid below: purpose. When people are committed to a cause they believe in, it gives them a reason for doing the things they do. No longer are they pushing a big rock up a tall mountain, but they’re doing something that matters, work that makes a difference. This is Southwest making travel fun. This is Nike making life an adventure. This is Apple making technology simple and elegant. The next level in the pyramid is passion, and it flows from purpose. A meaningful cause engages the emotions of people and lights a fire in their soul. One of my clients, The Retreat Day Spa and Salon, has as its purpose to help every woman who walks through their doors feel better about themselves. And this is what motivates all their employees, receptionists to stylists. Answering this question, “How can I make the woman in front of me right now feel better about herself?”, drives their interactions, from a warm greeting to a complimentary beverage, from a relaxing massage to a cut and style. Employees are passionate about this cause, and women flock to The Retreat. Not just to get a service they can get anywhere, but for the feeling they have when they leave. Adult Day Care … Really? I was was meeting for the first time with the president of a firm a client of mine had referred me to. We were discussing his business, normal first call stuff like annual revenue, gross margin, net before taxes and the like. I then asked about his employees. His answer stunned me. “You mean my adult day care program?” he said and began relating to me issue after issue of lapses in performance that had cost him thousands of dollars. A few more questions, however, revealed the real reason for his plight. The business had no purpose, and his employees no passion. If all you’re asking your people to do day after day is push a big rock up a tall mountain, they’ll stop caring, and you’ll end up with adult day care as well. Finally, the purpose that produces passion and the passion the delivers exceptional performance, ultimately impacts revenue generation. We are wired for why. When we get it, we throw ourselves heart and soul into our work. And that makes all the difference in the world in performance and profit. So start here with your people. Identify the greater good your business serves and unleash the vast reservoir of energy and emotion that lies within the very employees who already work for you. Your business will grow beyond what you even thought possible.